Will The Television Networks Cut Away From President Trump’s Border Speech? 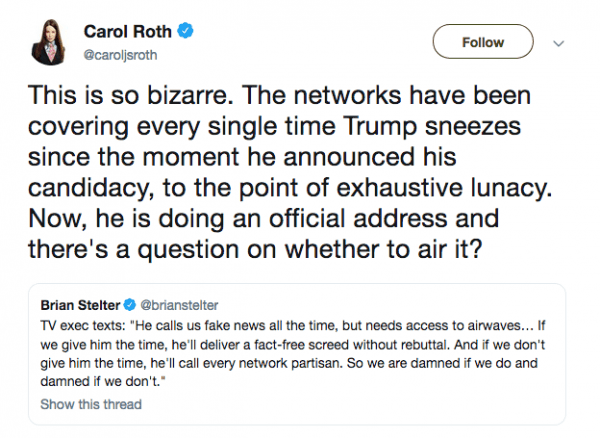 HomeWorldWill The Television Networks Cut Away From President Trump’s Border Speech? Update: Trump seeks an edge in shutdown fight with TV address (AP). WNU Editor: The networks are not going to cut-away …. Will Television Networks Cut Away From Trump’s Border Speech? (Hollywood Reporter). WNU will be covering President Trump at 21:00 EST.